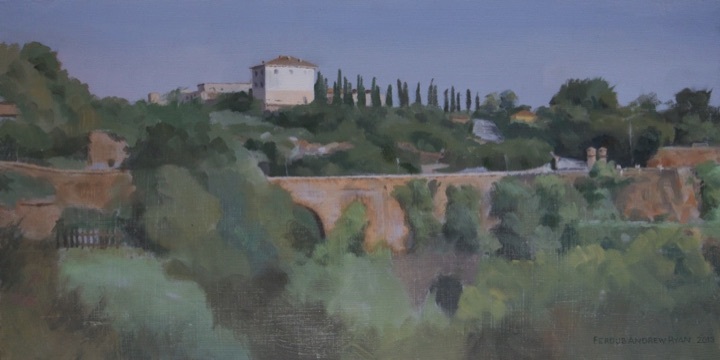 This plein air oil sketch is a view across the via Terrano bridge looking up towards Villa Bianca, the house from which Corot painted some of his famous views of Civita Castellana. I painted this when I was part of the Italian summer programme of the Jerusalem Studio School, under the direction of Israel Hershberg. Our studio was in the buildings behind the house, and a very cautious elderly owner allowed me on to the first floor balcony to paint the view behind us here of Fort Sangallo and the town. Corot actually painted from the top left bedroom window, but that was a step too far for this Irish random caller. The bridge crosses one of Civita Castellana's characteristic gorges which drew painters on the Grand Tour to the town.